На данном уроке мы познакомимся с модальными глаголами, которые выражают возможность или вероятность совершения действия. В ходе занятия мы узнаем, как строить предложения с данными глаголами, в чем состоят основные различия между модальными глаголами will, must, should, ought to, may, might и could, а также какие слова можно использовать вместо модальных глаголов для выражения возможности или вероятности совершения действия. В английском языке существует множество модальных глаголов, которые выражают возможность или вероятность совершения действия. Все эти глаголы отличаются по уровню уверенности говорящего в своем предположении (см. рис. 1). Мы знаем, что will и won’t используются, когда мы говорим о действии в будущем. His latest book will be out next month. A: You’ve got a letter from Canada. B: It’ll be from my aunt Freda. It’s Monday morning, so I guess right now Sarah willbetaking the children to school. Leave the meat in the oven. It won’t be cooked yet. Модальный глаголmust передает большую степень уверенности (strong probability) (см. рис. 2). Говорящий практически уверен в своем предположении (he has good reasons to expect that). It’s ten o’clock. He mustbe in the office now. – Сейчас десять часов. Он должен быть в офисе. (Meaning: I’m almost sure of that, because today is his working day, and his is usually at his desk in the morning). He must be a teacher. I have seen him at teachers’ conferences several times. (logical assumption) – Он, должно быть, учитель. Я видел его на конференциях учителей несколько раз. They have a huge house. They must be rich. (logical assumption) – У них огромный дом. Они, должно быть, богаты. Must in the meaning strong probability is used in two tenses: the Present and the Past. It must be Mr Smith. They must know his address. He mustbe working on his report at the library now. There is no light in the windows. They must be sleeping. В этом случае must выражает предположение, что действие происходит в момент речи или на протяжении настоящего периода времени. Note: strong probability in the future is NOT expressed by must. Instead we can use will+ probably/ evidently. If we say: He mustcome tomorrow, it means that we talk about an obligation or a strong necessity. Note: we do NOT use mustn’t to form a negative assumption. We use can’t instead. +This must be her daughter. They look very much alike. - This can’t be her daughter. They don’t even look alike. NOT: This mustn’t be her daughter. We use mustn’t only to talk about prohibition. She must have left for New York already. – Она, должно быть, уже уехала в Нью-Йорк. He must have told her the truth. – Он, скорее всего, сказал ей правду. She must have caught cold. – Она, вероятно, простудилась. She must have been walking her dog at seven o’clock yesterday. – Она, должно быть, выгуливала свою собаку вчера в 7 часов. He musthave been still sleeping when she called him in the morning. – Он, должно быть, все еще спал, когда она позвонила ему утром. They must have been dating for a long time before they got married. – Они, наверное, долго встречались прежде чем пожениться. Note: The second structure might also express the speculation about an action that started in the past and is still in progress. He looks happy. He must have been offered a new job. – Он выглядит счастливым. Ему, наверное, предложили новую работу. It must have been done already. – Это, наверно, уже было сделано. The letter must have never been answered. – На письмо, очевидно, так и не ответили. Итак, will выражает наибольшую степень уверенности в том, о чем мы говорим. Эта уверенность основана на нашем знании людей и вещей, их характеров и качеств. Must используется для выражения того, что, по нашему мнению, является наиболее логичным или рациональным вариантом в конкретной ситуации. Мы не имеем всех фактов, поэтому must обладает меньшей уверенностью, чем will. Should выражает наши предположения/ожидания. Предположение (expectation) в данном контексте значит believing that things are or will be as we want them to be or that something is going according to plan. He should be in Rome by now. Let’s call him. – Он должен уже быть в Риме. Давайте позвоним ему. She should be back in about an hour. – Она должна вернуться примерно через час. The lecture should be interesting. – Лекция должна быть интересной. Также мы можем использовать отрицательную форму shouldn’t для образования отрицательных предположений. This task shouldn’t be difficult for you. – Это задание не должно вызвать у вас затруднений. It shouldn’t take long to drive to that store. – Дорога до этого магазина не должна занять много времени. This dress shouldn’t cost more than $50. – Это платье вряд ли стоит больше $50. Should может употребляться в трех временах (can express a strongly expected action referring to the present, future or past). It’s Sunday. She shouldbe at her Mom’s house. Turn on the TV. Alison shouldbegiving her speech right about now. He shouldarrive in Chicago tomorrow. We shouldbemoving into our new house soon. Where is Alexander? He shouldhavearrived an hour ago. She shouldhavereceived my letter lastweek, but it was delivered only yesterday. Note: should is NOT used to express negative or unpleasantideas. It has the idea that we want the action to happen. You shouldpass the exam. You’ve worked hard. NOT: You should fail the exam. Если же речь идет о неприятных событиях (negative or unpleasant events), лучше использовать will. The underground willbe very busy now. NOT: The underground should be very busy now. У should в значении expectation есть близкий синоним – oughtto. Он может использоваться вместо should во всех приведенных примерах (except for the negative forms). He oughtto/ should be at home now. There oughtto/ should be no difficulties. She oughtto/ should have arrived yesterday. - Is it likely that…? - Is he likely to…? - Are you sure that…? - Is it possible that…? Isitlikelythat he will come back soon? Washelikelyto tell her the truth? Areyousurethat he is still at the office? Doyou think they will help us? Isitpossiblethat she is at home now? Areyousurethat he told Mike about it? Choose the most appropriate answer to express strong probability, expectation or logical assumption. 1. It is 10:00 a.m. He in the office now. 2. Try calling him in the evening. He home by eight. 3. I can’t find my car keys. I them in my office. 4. They live in a very big house. They rich. 5. I’m worried. He two hours ago. Where can he be? 6. Let’s watch the film about meteorites on Channel 6. It interesting. 7. There is no one by the name Lisa here. You misdialed. 8. This homework you too long if you’ve understood what you have to do. 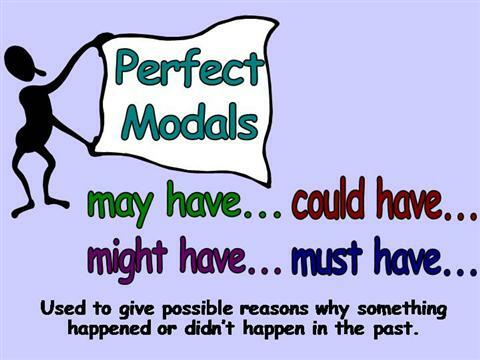 Very often we use other phrases to express strong probability rather than modal verbs. The adverb probably is widely used to express probability in the present, future, and past. There are also phrases like “I’m sure (that)…”, “I think that…” to express our opinion about probability of something. I’m sure that he lives near here. I’m sure that he’ll be able to help you. I’m sure that he was at home yesterday. I’m not sure that she has this book. I think he is rich. I think he left for New York yesterday. The phrase “I expect” and its variants can be used to substitute should. You canexpect to receive our report tomorrow morning. He didn’t expect us to find out the truth. The word possibility means that something is possible but the other variants also exist. 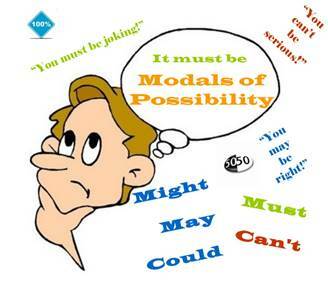 Such possibility is expressed by the modal verbs may, might and could meaning that the speaker thinks something is possible but doesn’t know for sure. Глаголы may, might и could употребляются для выражения возможности или вероятности совершения действия в прошлом, настоящем и будущем времени. Чаще всего такое предположение выражает оттенок сомнения или неуверенности. Мы можем использовать may + not для образования отрицательных суждений (negativestatements). He maynot be there now. – Возможно, его там сейчас нет. I maynot go to the party tonight. – Может, я сегодня не пойду на вечеринку. She maynot come. – Возможно, она не придет. A: Where was your girlfriend last night? B: I think she mayhavebeen at the cinema with her friend. Might – близкий синоним may. Он также выражает вероятность или возможность совершения действия в настоящем, прошлом и будущем времени. Но обычно он выражает меньшуюстепеньуверенности, чем глагол may (it is slightly less certain). I might not be back in time for supper, so don’t wait for me. It might rain. Take your umbrella. Структура might + have + past participle выражает возможность/ вероятность совершения действия в прошлом (см. рис. 3). She might have left Liverpool. – Она, возможно, уехала из Ливерпуля. He mighthavevisited them yesterday. – Можетбыть, он был у них в гостях вчера. He mighthavetold her the truth. – Возможно, он сказал ей правду. A: Where is Harold? – Где Гарольд? The film could be worth seeing. It had a good review. – Возможно, этот фильм стоит посмотреть. У него хорошие отзывы. - could also suggests that something is less likely or that there is some doubtabout it. It could be John, but I can’t see clearly. You could be right. I’m not sure. Couldне используется для выражения будущейвероятности. Для выражения предложения в отрицательной форме со значением возможности и вероятности употребляется форма may not или might not. You might not be right. NOT: You couldn’t be right. The film might not be any good. NOT: The film couldn’tbe any good. Couldn’t/ can’t используются только для выражения удивления, сомнения или недоверия. It can’t/ couldn’t be true. – Не может быть, чтобы это была правда. Anton couldn’t be lying to us. He is an honest man. – Не может быть, что Антон лжет нам. Он честный человек. It couldn’t have been Tom. Tom was in Chicago last week. – Это не мог быть Том. Том был в Чикаго на прошлой неделе. She couldn’t have said it. – Не может быть, чтобы она сказала это. He couldn’t do that to me. – Он не мог так со мной поступить. She couldn’t have a ten-year-old daughter! She is only 21 herself. – У нее не может быть десятилетней дочери. Ей самой только 21. Конструкцияcould + continuous infinitive (V + ing) может употребляться, когда высказывается предположение, что действие совершается в момент речи. She could be waiting for you near main entrance. – Она, может быть, ждет тебя возле главного входа. He couldbe still playing tennis at the club at the moment. – Он, возможно, все еще играет в теннис в клубе в данный момент. Could + have + past participle может употребляться для выражения возможности и вероятности, относящихся к прошедшему времени. A: I can’t find my iPod anywhere. – Я нигде не могу найти свой iPod. B: You couldhaveleft it at home. – Возможно, ты оставил его дома. He couldhavehad an accident. – Возможно, он попалв аварию. I really don’t know where he could have been last week. – Я действительно не знаю, где он мог быть на прошлой неделе. Модальные глаголы may, might и could (можетбыть, возможно) употребляются для выражения разной степени возможности и вероятности совершения действия в настоящем и будущем времени (см. рис. 4). Конструкцииmay/might/could + be + Ving могут употребляться, когда высказывается предположение, что действие совершается в момент речи. They may be watching TV at the moment. Her sister might be reading a book now. She could be waiting for you near main entrance. Конструкцииmay/might/could + have + pastparticiple могут употребляться для выражения возможности и вероятности, относящихся к прошедшему времени. Why didn’t he go to the party yesterday? - He may have been busy. - He might have been sick. Конструкцииmay/might/could + passive infinitive могут употребляться для выражения пассивногозалога. She mightbeoffered a new job. It couldbedone in a different way. May, might и could имеют свои особенности употребления. May и might в значении possibility не используются в вопросах (NOT used in questions). Вместо них используются фразы: “be likely”, “bepossible”, “be sure”, etc. Couldcan be used in questions, but we need context to distinguish the meaning possibility from the other meanings of could. 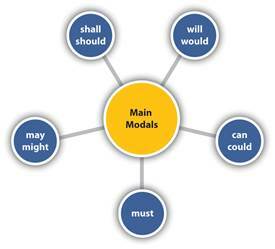 May and might are also used in combinations with “have to” and “be able to”. He mayhave to move to the South soon. – Возможно, ему скоро придется переехать на юг. She mighthave to sell her apartment. – Возможно, ей придется продать свою квартиру. He mightbe able to help you. – Возможно, он сможет помочь вам. They mightnot be able to come to the party tomorrow. – Возможно, они не смогут прийти на вечеринку завтра. He mighthave been able to solve this problem. – Возможно, он смог решить эту проблему. 1. He be able to help you. 2. A: Where is Anna? B: I don’t know. She be at the swimming pool or in the park. 3. It be as easy as you think. 4. Don’t ring the doorbell when you get there. Maria’s little baby sleeping. 5. A: How did the robbers get in? B: We don’t know yet. The old woman to lock the door. 6. I called her but there was no answer. She left for New York already. 7. When can I see him? come back before six today? 8. I wonder who wrote that letter. Jim have written it? 9. He said that he go to Italy in June or July. 10. I don’t know what time I’ll be home. I be quite late, I’m afraid. упр. 526 стр. 421 Голицынский Ю.Б., Грамматика. Сборник упражнений, Каро, 2011. (Источник). упр. 534 стр. 426 Голицынский Ю.Б., Грамматика. Сборник упражнений, Каро, 2011. (Источник). Возможно, ей больше нравится спортивная обувь. (Звонок в дверь) Это наверняка тетя Мари. Ты, скорее всего, поступишь в этот университет. Неужели она использовала весь сахар? Я не уверена, но он, возможно, забыл забронировать номер. Не может быть, что ты не помнишь его имя.